Here's another new favor box from Sizzix and it is called "favor box". I used the strawberry sizzlit die to hang over the box. Seeing all those strawberry projects that Lori made this past weekend inspired me to finally use this die. Can't believe it was sitting on my table unopened since last year. Sizzix XL favor box die, stawberry sizzlit, Doodlebug glitter dot paper, CB swiss dots folder, Stickles gg, Offray ribbon, pipe cleaner and bakers twine. Thanks for stopping by and have a great Monday!!! That is a very nice/cute box, Cheryl! I like that doodlebug paper. It matches well with the strawberry and all! It looks very xmasy...you could make it for goodies to give Christmas time too. 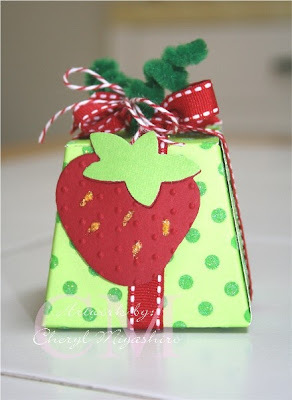 Cute little box you created... love the strawberry! Very cute!! I really love strawberry things too!! 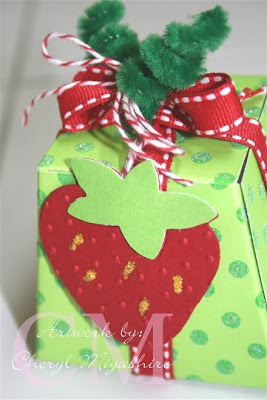 I still have to use my strawberry die and now I need this box! So cute! Great idea to turn it into a strawberry!! Berry cute!! I love that green paper, goes well with the red. What a cute favor box. The strawberry is sweet. I think I have it too, and did not use it!! love the box! the strawberry is a cute addition to make it more sweet! it looks like Christmas in July =) now I have to debate on whether or not to get this one too! TFS! have a great week!